Other intelligences are what made me fall in love with science fiction—really different, new, unusual creatures and characters. 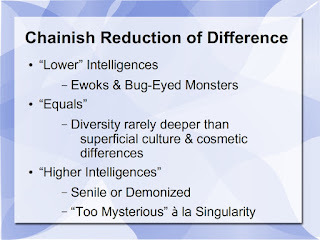 These different kinds of thinking beings—superhumans, robots, aliens—are a central feature in a lot of SF/F. What I'm hoping to show today is two ways of thinking about that intelligence. 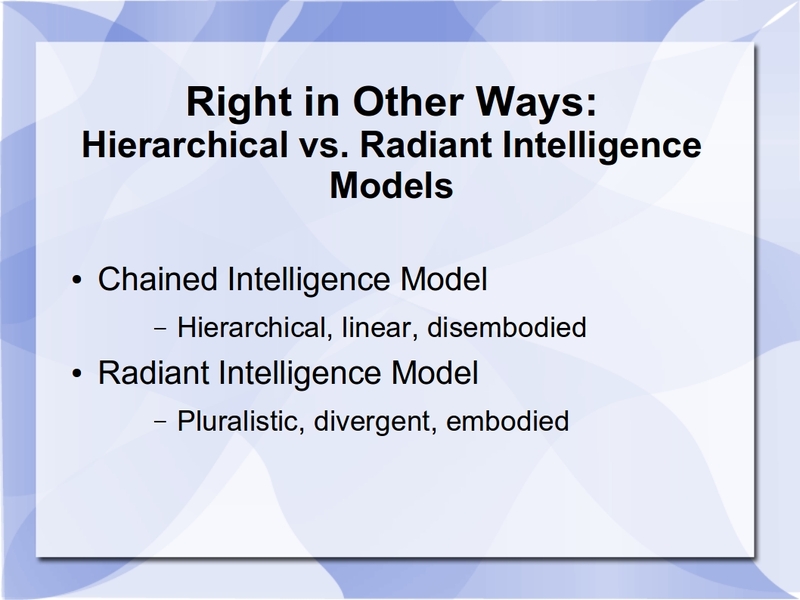 I'm going to call the one way the “Chained” model, after the Great Chain of Being, and the other way the “Radiant” model, which has a more diverse and pluralistic approach. 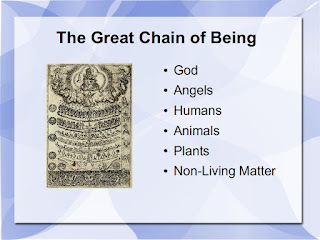 The “Chained” model intersects with Cartesian Dualism, so we'll look at that as well—both tend to disembody intelligence, with some unfortunate consequences. As a kind of framing thought here, I like looking at science fiction and these ideas as a two-way street. On the one hand, these ideas are pulled from elsewhere in society. But on the other hand, fleshing out abstract ideas in stories gives them a lot of weight in society, more than they might have had as dry theory. That's great when it makes difficult concepts comprehensible, or scary new ideas less so—but it's troublesome when it allows problematic ideas to live past their expiration date. 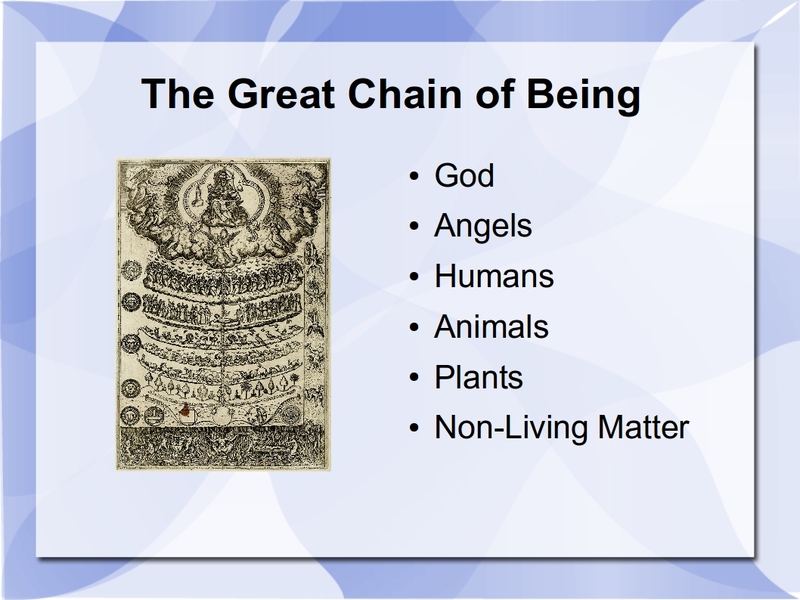 So to dive right in: the “Great Chain of Being”. This is a very particular and ordered concept of the universe, a ranking of all the beings that exist. You probably know how this works: we've got God at the top, then angels, humans, animals, plants, and rocks and nonliving matter at the bottom. This idea was formulated by the Greek philosophers, most notably Aristotle, and then taken up again and expanded on by Medieval Christian theorists. The Great Chain concept becomes extremely prominent again in Western European thought in the 17th & 18th centuries, and it has left many traces that are still with us today. 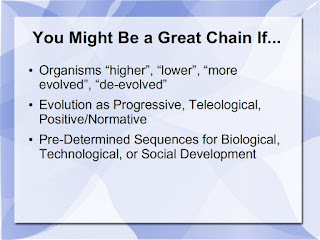 You can see just looking at the Great Chain that there are some problematic implications, especially if you take the stance that lower orders exist to serve the higher ones. In that case it becomes a rich source of classism, sexism, racism, and let's not forget speciesism. It works really well to preserve inequality—because it posits the “natural order” as inherently good; yet also justifies exploitation of groups defined as “lower” on the chain. In this context, the idea's centrality to slave-reliant Greek society, feudal Christianity, and colonial/imperial Europe makes a lot of sense. As the sciences developed, the Great Chain model was rejected—the modern tree of life decenters humans as thoroughly as Copernicus did in the solar system. 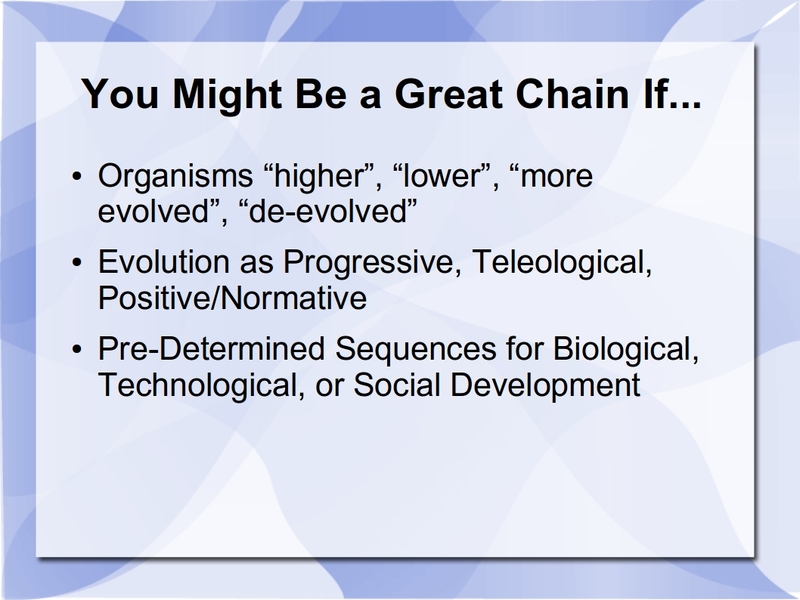 Unfortunately, Great Chainish thinking has persisted, and has frequently been misapplied to evolutionary concepts; science fiction has been really bad at repeating and popularizing some of these misconceptions. Placing all possible intellectual development along a single track from low to high is a clear Great Chainish move, and it dramatically limits the kinds of intelligence we can imagine. Less intelligent species are dismissed as savages, possibly noble ones, but not equals, while equally intelligent species are functionally humans in different bodies, with no truly radical differences. However, science fiction is very uncomfortable around the idea of superior intelligence—by Great Chainish thinking, they should be our ethical and practical superiors—so most of the time when you see a “superhuman intelligence” you also get some kind of narrative device to minimize or contain that threat. Most commonly, superhuman intelligence is demonized and dehumanized—think of Wells' Martians, “minds vast and cool and unsympathetic”, or pretty much every robot uprising narrative—cold, unfeeling AI hunting us down. The Singularity can also be seen as a Chainish strategy. One thing that inspired this talk is an essay Jo Walton wrote a couple years back, where she complains that the entrenched idea of the Singularity has made people “afraid to write the kind of SF that I like best, the kind with aliens and spaceships and planets and more tech than we have but not unimaginable incomprehensible tech”. The Singularity is often invoked to avoid confronting superhuman intelligence by just making it “too mysterious”. Its Great Chainishness is also clearly visible in its religious framing of “machine gods” and “the rapture of the nerds”, and the idea that it's this foreordained endpoint that technology is evolving towards. 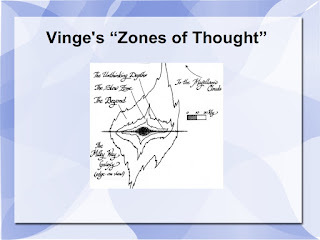 Vernor Vinge coined the term Singularity, and then created his “Zones of Thought” novels essentially so he could duck the issue (and I should mention that he does some interesting work with cognitive diversity in those). But note the clear resemblance to the Great Chain here, albeit in more dimensions. As a final note here, when you compress the infinitely-graded Great Chain to just a few steps (lower, same, higher), you can easily move to a binary that's just “us and them”, “the same and the other”. 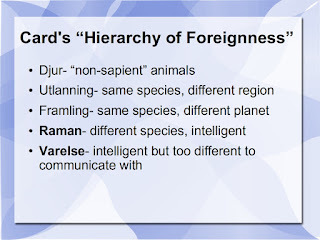 My favorite example of this is in Orson Scott Card's Ender books, where he explicitly lays out and uses a “hierarchy of foreignness”, the important categories of which are “raman” and “varelse”. Raman are persons, intelligences, that we can communicate with, although they might not be human in shape. 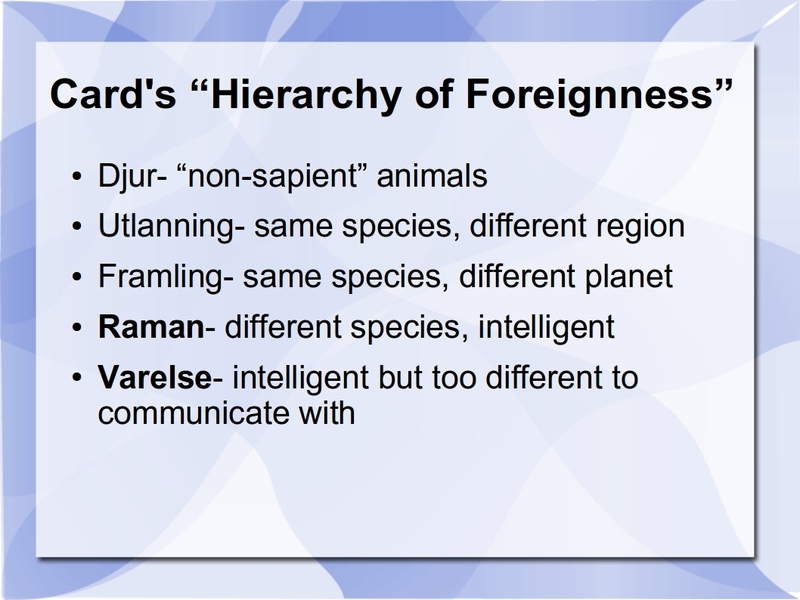 Varelse are beings who might be intelligent, but they're not like us, we can't really communicate with them. And despite a lot of complications in Card's ethical debates that we can't explore right now, his conclusion seems to be that war with varelse is inevitable. 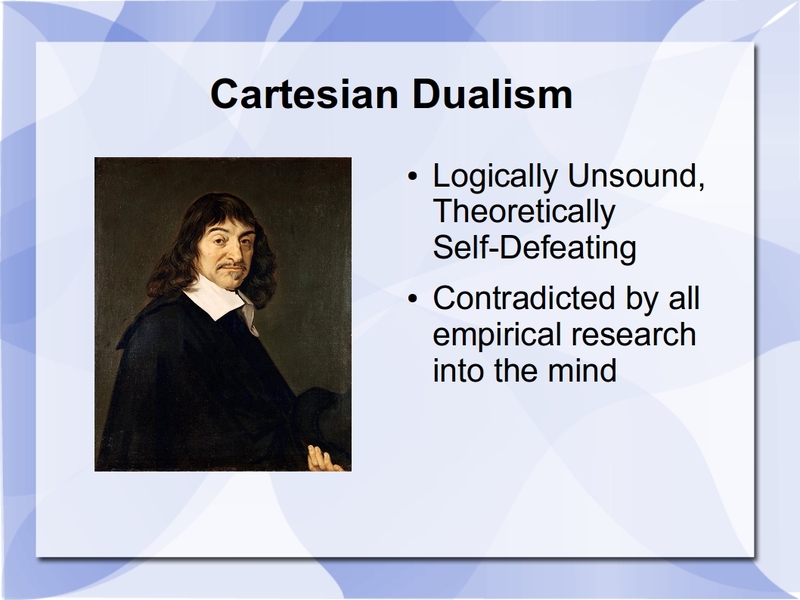 Cartesian Dualism is the idea that minds are radically different than bodies—that there are really two kinds of substance in the universe, mental stuff and physical stuff. Three points to make about this idea: it's logically/theoretically wrong, contradicted by all empirical studies of the mind, and has a number of distinctly negative impacts on our society. 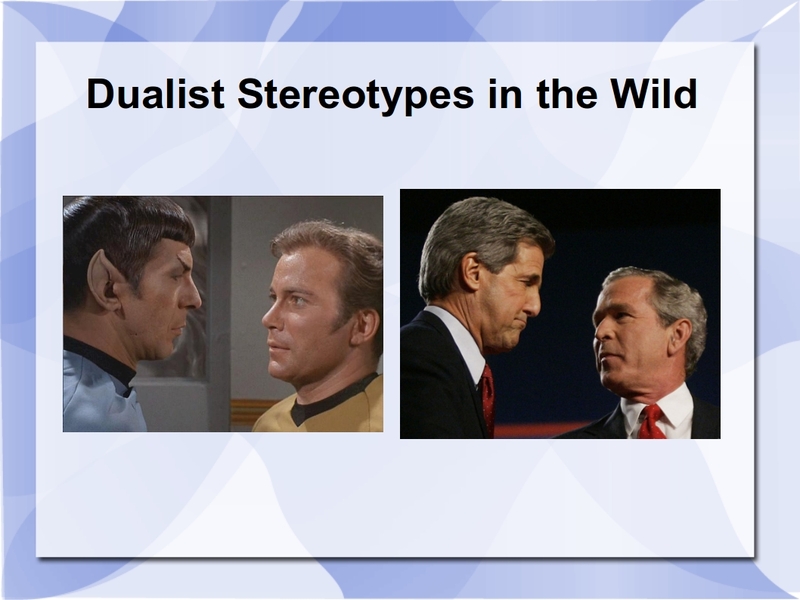 Unfortunately, despite those points, Dualism is deeply embedded in our culture, in our folk psychology, in our policies and ethics. And our speculative fiction, it turns out! The most blatant place we see Dualism in genre fiction is in the continued use of souls—immaterial minds—as valid plot points. Science fiction is as guilty of this as fantasy, though the souls may be dressed up in pseudo-scientific language. We see the immaterial mind at work in unproblematic “personality backup” technologies beloved of many SF writers today, and in the all-but-obligatory Freaky Friday episodes of televised SF, where the characters' minds switch bodies. Sexism: dualism is heavily involved in some aspects of sexism, particularly the false binary that associates men with the mind and women with the body. Mental/Bodily Health: by treating mental health as “less real” than more clearly physiological medicine, we've got ourselves into a pretty terrible spot on both counts. Free Will Myth & Bad Social Policies: Dualism encourages a fairly silly notion of a disembodied and radically free will, unaffected by material conditions, and thus excuses ongoing material inequality. Animal Cruelty: dualism has generally denied—or made it easier to deny—that animals have consciousness, contributing to our massive, systematic disregard for animal rights. Religion: way too big to get into in the context of this paper. 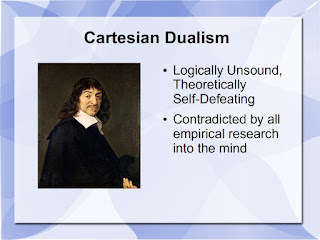 Short version: many problems caused by religion are directly or indirectly related to dualism. Anti-Intellectualism: and finally and curiously, there's an odd mutation of dualism that winds up creating anti-intellectual stereotypes. 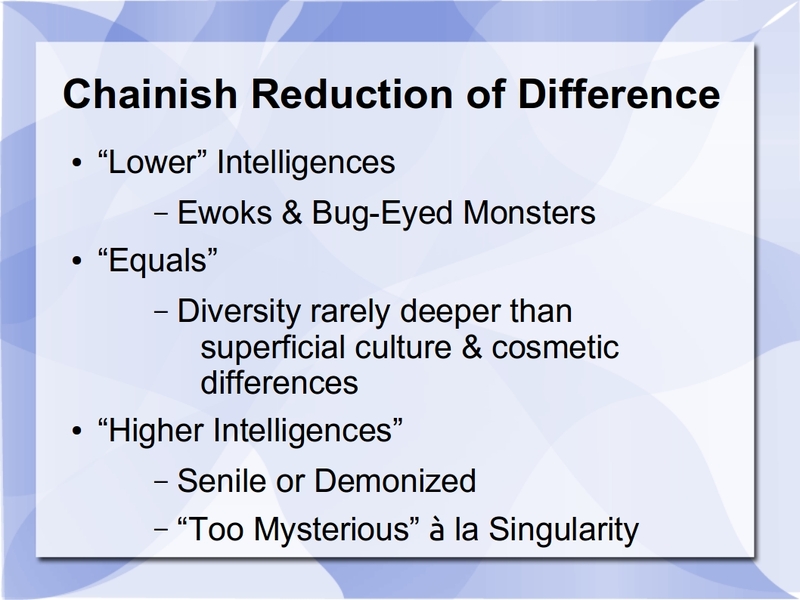 Much as Great Chainish narratives find ways to minimize superior classes of being, Dualism provides a way to minimize intelligent individuals. In a word: Spock. By flipping the Dualist order around, and making emotions—bodily feelings—more concrete, real, or important than abstract “thoughts” and “logic”, we restore to primacy the “normal intelligence” of the “normal human”. The cold/rational/gifted characters are relegated to side-kicks or villains, constantly setting up and reinforcing this false dichotomy of logic and emotion. These narratives further an incorrect, dualist conception of intelligence and emotion, while also providing potent anti-intellectual tropes. 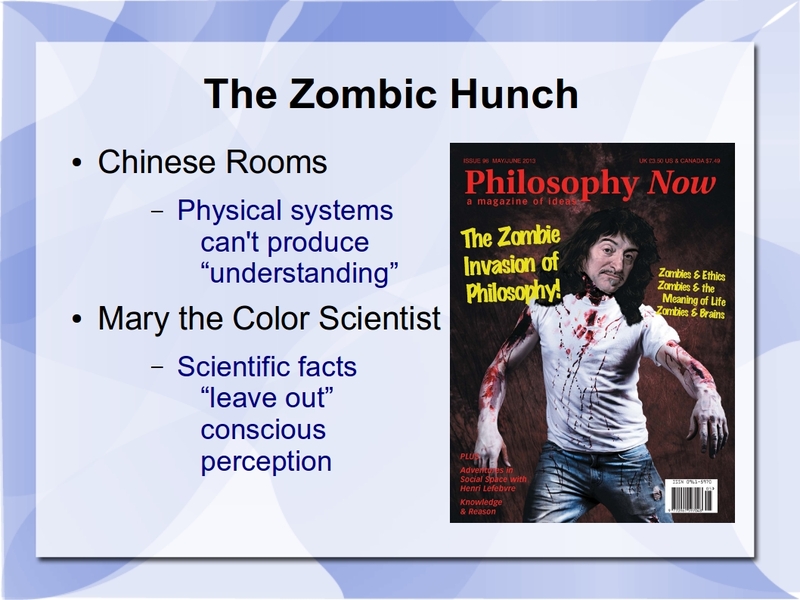 SF also propagates a Dualist notion called “the Zombic Hunch”--the disturbing idea that a seemingly intelligent being actually has no consciousness inside. 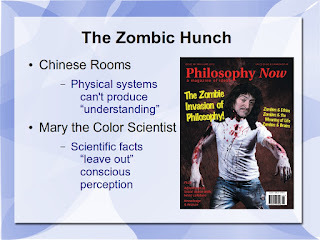 Zombie variants like “the Chinese Room” and “Mary the Color Scientist” continue to color our discussion of non-human intelligences—the ideas frequently crop up in Robert Charles Wilson's & Peter Watts' work, and in SF/F about robotic or insectoid intelligence. The “Mary” pseudo-argument recently cameo'd in the film “Ex Machina”. The Great Chain limits cognitive diversity in SF by making intelligence very linear and hierarchical. 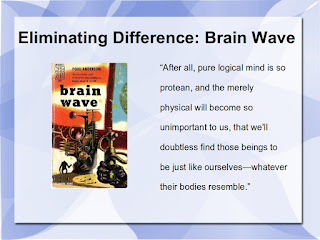 Dualism misconstrues intelligence as separate from the body. Both models have the effect of disembodying cognition—privileging an abstract “spirit” or “mind”--and one result of this is an inability to conceive of radical alterity, of really different minds. 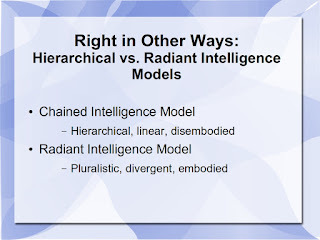 So having laid out a few ways that speculative fiction helps keep the Great Chain & Dualism alive in popular thinking, and how those concepts affect the creation of and attitude towards fictional intelligences, I want to briefly gesture towards a few strategies and writers that are departing from those concepts—what I called “Radiant” cognitive models. 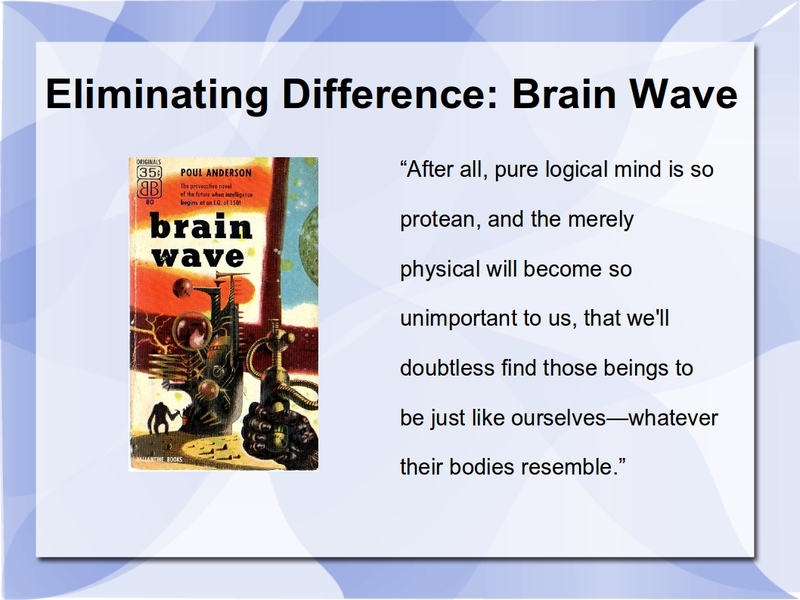 A number of authors have been inspired by modern cognitive science, which often reveals facts stranger than fiction: current research informs neurodiverse humans, post-humans, and AI in the work of Greg Egan and Peter Watts, for example, while Kim Stanley Robinson's “2312” engages a great range of cognitive diversity in a highly pluralistic society, and is also noteworthy for its treatment of animal intelligence. 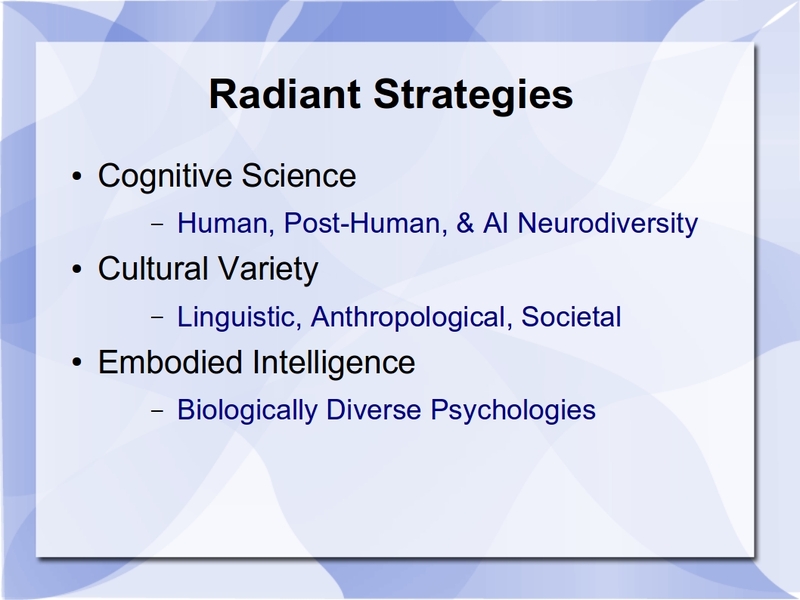 Another route to cognitive diversity focuses on cultural difference, a frutiful strategy of many feminist SF texts. Elgin's “Native Tongue” trilogy uses a woman's language to escape patriarchal constraints; Le Guin's “Hainish” species, though slightly biologically different, are most distinguished by their varying anthropological and political structures; the Mattapoisett society in Piercy's “Woman on the Edge of Time” has achieved a kind of emancipatory utopia through careful social engineering. My favorite sub-genre of SF is the really alien aliens. 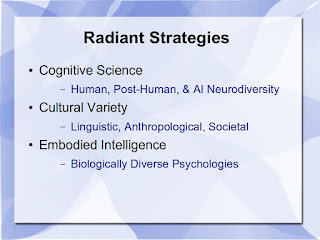 Not just different biologies, but richly diverse in culture, in motivation, in psychology. In how they think! There are a number of writers who do this well; C.J. Cherryh, who frequently portrays aliens in ways that contradict the Great Chain and Dualist ways of thinking, can provide a few examples. In her “Chanur” novels, she introduces us to seven wildly different alien species, some of whom can't even communicate directly. 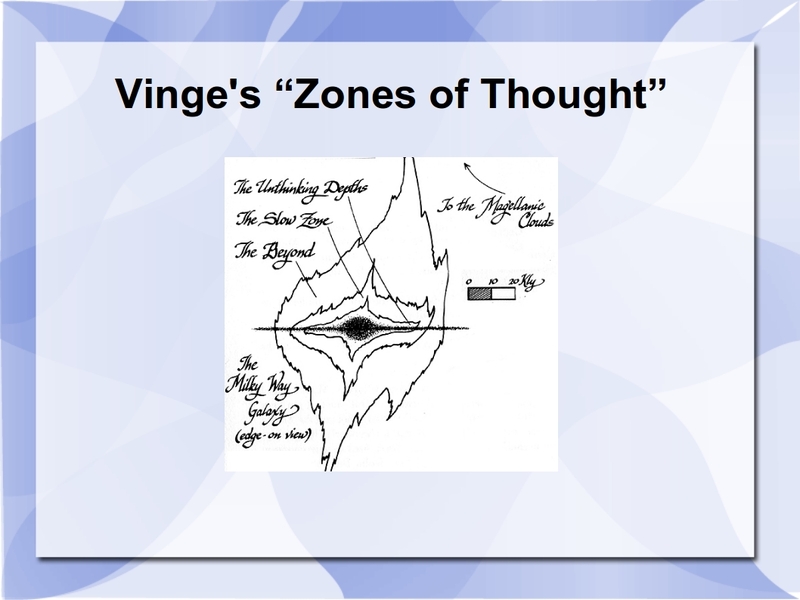 An interesting point—and one that opposes Card's stance on varelse—is the idea of caution and non-aggression in direct correlation to how little another species is mutually comprehensible—or as Pyanfar puts it, “Gods and thunders, you don't pick a fight with something you can't talk with!” The series is rife with characters of different species second-guessing themselves, trying to understand each other, trying to deceive each other, trying not to accidentally deceive each other by stepping into each others' blind spots. A moral that is repeated throughout is the the virtue of not trusting one's gut, not trusting that intuitions honed on one set of evolutionary experiences will adequately explain a different set. In Cherryh's difficult but rewarding early novel, “Hunter of Worlds”, that point is very bluntly made: “instinct is not always positive for survival when you are offworld.” “Hunter” examines and to some extent deconstructs the idea of a superior, Spock-like intelligence in the form of the alien iduve; one of the things that makes the novel so difficult is how far from generic conventions it ultimately strays—the iduve really are practically superior to humans, which leaves us in a very uncomfortable spot. In “Hunter” as well as in her “Foreigner” series, Cherryh also repeatedly rejects the trope of teaching aliens human values—her human characters learn at their peril that other species have their own identities and emotions. That's just a rough, very quick sketch of some works that are breaking from Chainish/Dualist depictions of cognition, what I'm calling the “Radiant” approach. In sketching out the problem of Great Chainish & Dualist models in SF, I'm hoping to encourage more critical engagement with these concepts. It's disturbing to see the Great Chain & Dualism reinforced through science fiction, especially at a time when anti-intellectual or anti-scientific biases are such major factors in our society. But! As I hope I've at least indicated, there are countervailing traditions that pull on more realistic conceptions of embodied minds, and it's in these works that I find—not only the most inspiring speculations, but the characters who most deeply fulfill that desire to meet strange new beings. Other intelligences. Thank you. Jake Casella runs the Positron site and is active in many Chicago SF/F book clubs. Please be sure to check out the other papers from our panel.